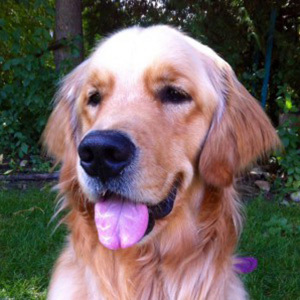 Pluto was born December of 2011 and was one of eight Goldens in a litter bred by Helping Paws. Helping Paws, Inc. is a non-profit organization that trains service dogs to be partnered with a person with physical disabilities or a veteran with PTSD. Jane became his foster mom and trainer in February when he was just 8 weeks old. His first worldly event was a Super Bowl party – a party for Chinese students visiting at Minnetonka High School, and Pluto was the hit of the party. He was passed around and photographed until he fell asleep in a corner. From the beginning, it was apparent that he was a very sociable dog. Together, Jane & Pluto attended training sessions and social events for almost three years. When it was time for Pluto to be matched, it became apparent that working in a one on one relationship was not the right career for Pluto. He was too social and too curious about the world around him. So what does one do with a social, people-loving dog? In his spare time, Pluto loves playing with his Shiba Inu sister named Mavis. She is much older than Pluto and just 20 pounds, but that doesn’t stop her from having a romp with her little brother. In fact, she often wins because she moves quickly and can “attack” from all sides. Pluto loves his squeaky balls, and besides chasing them will follow Mavis around the house squeaking in her ear. Little brothers can be so annoying! Pluto also loves taking walks on park trails and is always on the lookout for someone who just might stop and pet him.